develop a project to present on Tuesday after dinner. Infusing global health into the introductory biology curriculum enhances the linkages between cell and molecular levels of organization and the ecology while connecting students to real world issues of quality of life and social justice. The human right to good health is a right of populations. It includes far more than access to medical care, although that is certainly important. The Millennium Development Goals of the UN emphasize the need to alleviate poverty, a key strategy for good health. Good health is based on availability of clean water, good food and sanitation; it is enhanced by maternal education, lack of environmental pollution and peace. Students can construct relationships between life expectancy and the determinants of health using data made available by UNICEF, FAO and other international organizations. Videos from UNICEF, Partners in Health and other NGOs enhance understanding by providing examples of the lived experience of individuals with epidemic diseases, food shortages, or the challenges of obtaining good water. Online resources such as the graphing tools of Gapminder and the mapping tools of Worldmapper enable students to enter into investigations based on data used by professionals to define local and global needs. Teaching about global health engages students’ intellects as they grapple to define the problems that have already engaged their emotions. and post to the web as summer 2010 projects. resources, media, workshop presentation, etc. Note: We will begin running a shuttle van to the bus station at 11:00 A.M.
You should plan to arrive at the O’Hare airport at least 1.5 hours prior to departure. Van Galder Shuttle buses depart regularly for O’Hare Airport from South Beloit. bus departs Friday and when each bus arrives at O’Hare. 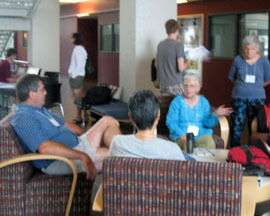 BioQUEST Summer Workshop 2010 is powered by Wordpress. Mezzanine theme by Redworks.